Design, create, and publish signature content for Apple News. Apple News is an iOS and macOS app that delivers articles from newspapers, magazines, websites, and other sources. 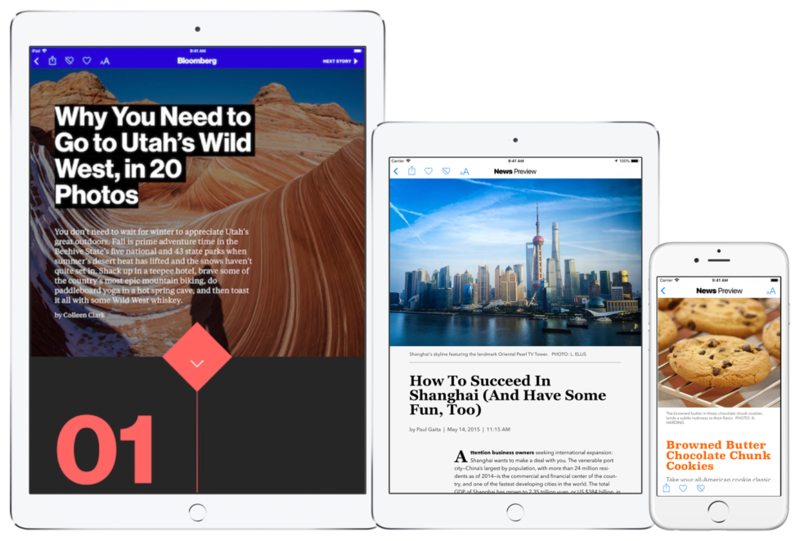 News automatically optimizes your content for iPhone, iPad, iPod touch, and Mac to give your readers the best experience for their device. As an Apple News publisher, you can use the in-depth design capabilities of Apple News Format to create unique articles with beautiful typography, compelling animations, and rich photo galleries and videos. You can then use the Apple News API to publish your content to News and manage your published articles. Register as a publisher, set up a channel, and choose how to publish your articles. Create a basic article and then add advanced design features. Get Apple News Format reference information, and create signature content for Apple News. Check out new features and enhancements. Publish and manage Apple News Format articles.